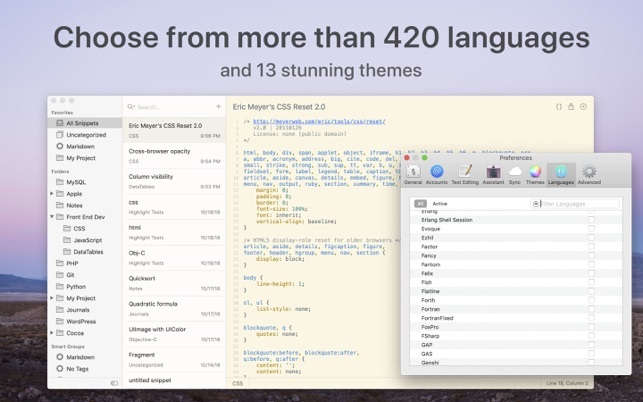 • Support for printing, sharing, macOS Services, etc. 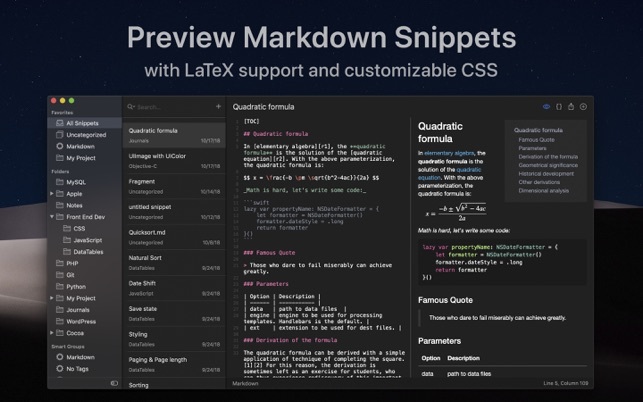 Markdown Support - SnippetsLab is also a full-featured markdown editor! • Sync: Customize the library location to use any 3rd-party file-based sync services (such as Dropbox or Google Drive). 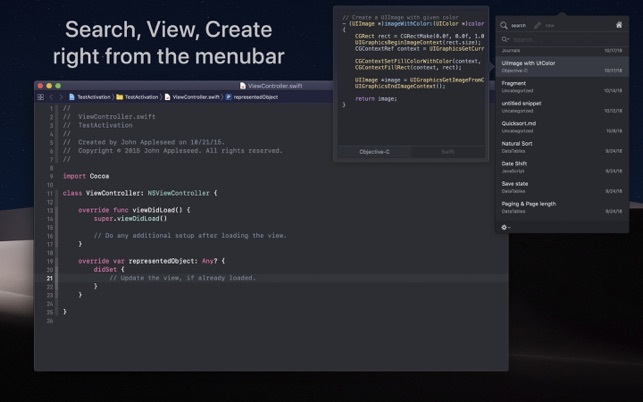 I cannot get it to work, I simply saw a Mojave dark theme which is not dark mode. I am a developer and would never put a comment like this here since it belongs as a tech support email which the developer has seemed to have eliminated the ability to email contact from his website which I am shocked over and keep thinking I just missed it. I have dealt directly with developer prior and was great and I am dependent on this app so much now, I'd not want to see it go down that path. So Rentel, if you are reading this, please restore or answer this with contact email. I am a heavy duty user of your app and otherwise love it. Hey, thanks for getting in touch — I just sent you an email answering your questions. If you have not received it, please shoot me an email to support@renfei.org. Nice idea and all, but unfortunately there is no effective way to synchronize snippets between machines. Just touching the iCloud tabs in Preferences will send the app into an infinite spin as has been the case over several versions now. So unless you want to start to manually create a document with another app where you keep all your snippets and then manually transfer those back into this app on each machine, you're fresh out of options. And that of course completely defeats the purpose of this app. If you only run one computer though this may not be of concern. 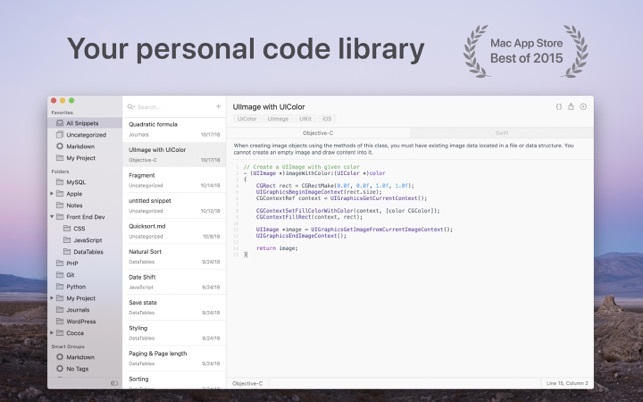 BTW: Can't verify the author's claim of "Mac App Store BEST". Seems he only added that headline as a shameless marketing gimmick. Well - I fell for it, so at least someone is making money. Updated Review: Problem Sharing Snippets between computers. - Good to use if we work in only one computer. 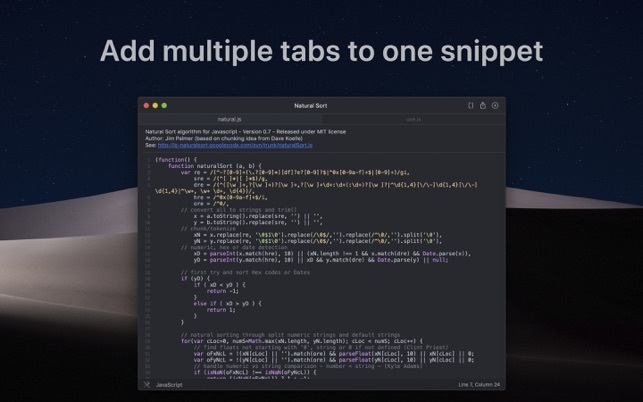 - can easily make snippets and upload as github gists. 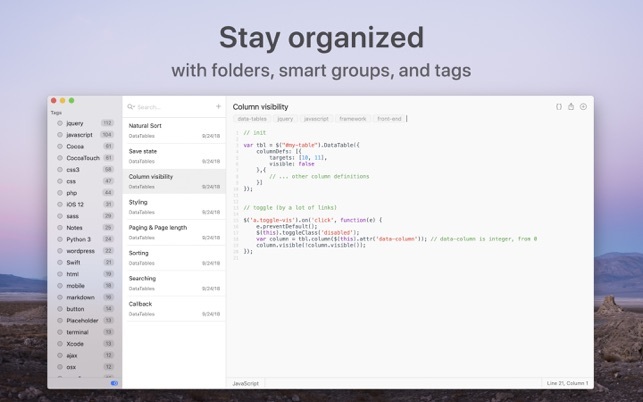 - nice syntax highlighting and can view markdown preview of markdown snippets. 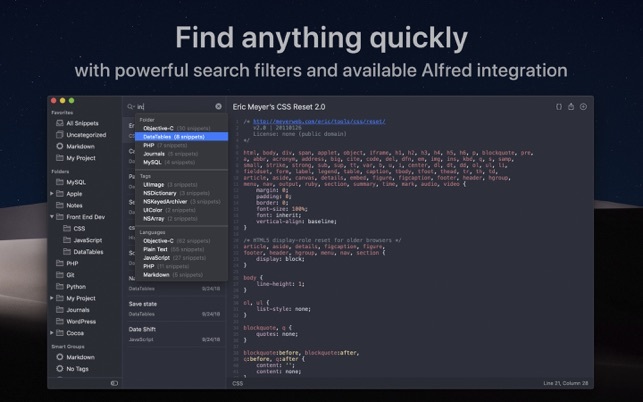 - nice alfred workflow to use. - I am having problem syncing between laptop and office computer. - Gist integration is not two way, if we update gist in github, we can not import it in Snippetslab. - Lepton is free app, which allows two way GIST INTEGRATION and snippets are instantly uploaded to GitHub. But it can not save local snippets, does not have alfred workflow, and does not look as nice as snippetslab. - I have not tried quiver and dash, i have not a good incentive to try those apps. synced and i might have to wait two days or more to use them there.